Experience the feeling of luxury in your bedroom by sleeping under these high-quality organic cotton duvets. They have a soft and smooth texture with natural filling that will keep you calm and comfortable. 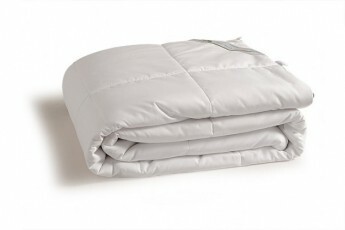 These duvets are ideal for all seasons as they are neither too thick nor too light. You can use them in AC environments as well. Filled with premium grade aloe vera extracts they are beneficial for health and for the skin. Everyone loves to sleep in pleasant warmth and comfort. To make it possible Homescapes has designed a duvet which is made from cotton and filled with natural aloe vera extracts. Aloe vera filling helps to energize your body and keep your skin fresh and hygienic while cotton fabric offers a smooth texture where you can sleep in total comfort. These natural organic duvets will keep you warm in cold freezing nights and maintain a consistent temperature of your body so that you feel sweaty. The natural extract of aloe vera is ideal for the skin. They repel bugs and germs which will keep you nice and comfortable. You will never feel any irritation on your skin, in fact, you will experience a soft calming sensation. With cotton fabric and aloe vera filling, you will never have any problem in sleeping. They are firmly woven and stitched to prevent any wear and tear. Every member of your family can experience the soothing comfort of these duvets anytime. Buy duvet online at homescapeindia and choose the size you prefer. These eco-friendly duvets are thoroughly checked before delivery to ensure the finest products to our customers. We offer the finest quality products at an affordable price. We also provide free shipping services to anywhere in India for the convenience of our customers.